An article in the May 23 issue of the magazine Foreign Policy entitled “Pulp Liberation Army” surveys the strange and terrifying underground world of Chinese military fantasy novels. One such novel, 2066: Red Star Over America, “portrays the United States in the throes of a Cultural Revolution, where bands of marauding U.S. students fight battles in the country’s ravaged countryside. China is the world’s top superpower, and an earthquake has sunk Japan, erasing it from the map. The protagonist, a Chinese Go player and diplomatic envoy, tries to return civilization to a crumbling United States.” Go player to the rescue! Read the full article here. Thank you Matthew Curran for sharing this. 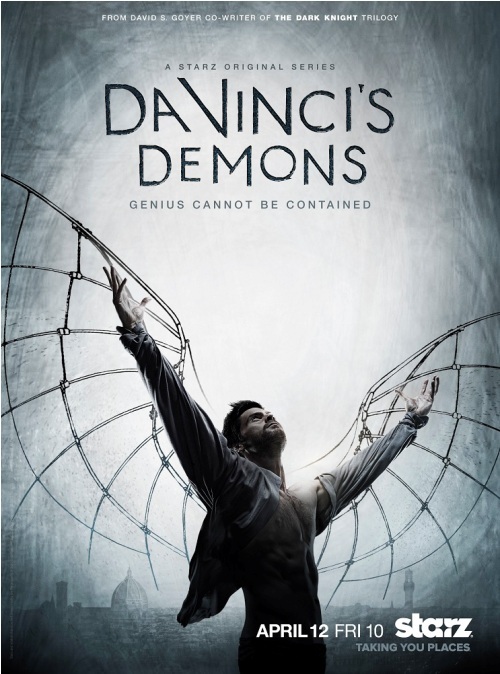 The most recent episode of Da Vinci’s Demons “The Prisoner” (Episode 3) — is structured to parallel a game of go, played by Riario and the eponymous, mysterious prisoner. “The villain forces a prisoner to teach him go,” reports EJ reader Diego F. Pierrottet. 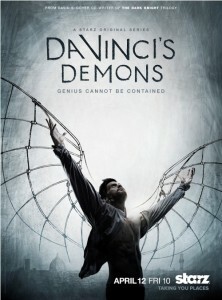 “The villain then uses the go strategy and philosophy that he is learning against his enemies, in this case DaVinci’s employer and DaVinci himself.” The series airs Friday nights at 9 pm on Starz. 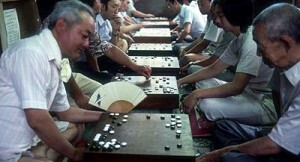 Read more about this in our October 22, 2011 post: Go Spotting: The Mystery of Detective Dee and the Go Board. “I found this in an old manga called Vagabond which follows the swordsman Miyamoto Musashi,” writes Taylor Litteral. 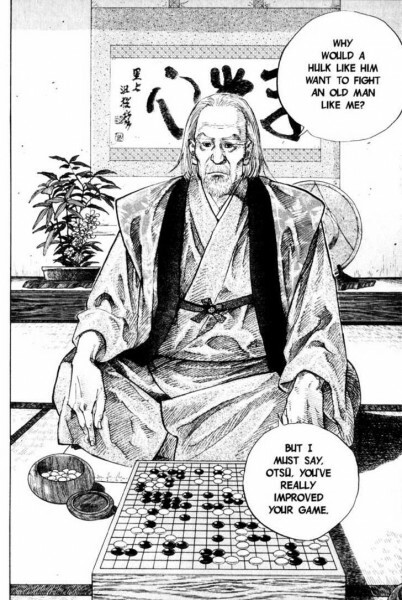 It was in Volume 6, chapter 50, page 6. The Walthers brothers are tantalizingly close to raising the $8,000 they need to create a free movie trailer (German Brothers Team Up to Produce “Fascinating” Go Video 2/4/2013 EJ) to inspire more go enthusiasts. 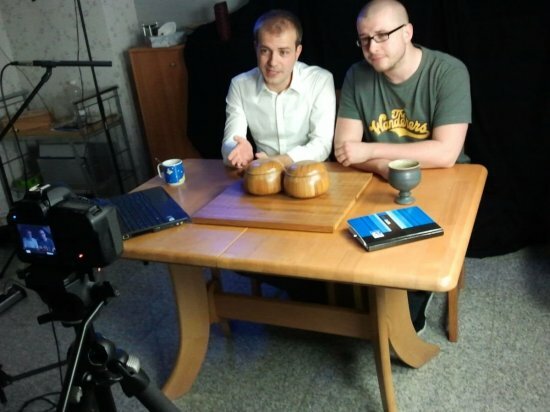 Sven Walther, a go player and computer scientist, and his brother Lars, an actor and filmmaker, plan to make the video available on YouTube, so anyone “can use it to promote the game wherever you want.” Their goal “is not to explain the rules, but to create some fascinating atmosphere to represent the game. 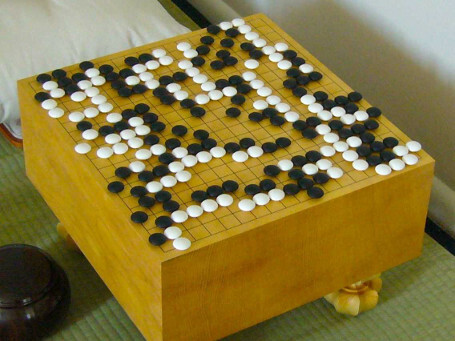 The novice will see it and say ‘Whoa, what’s that game? Wanna learn more!’” The project will only receive funds if at least $8,000 is raised by Monday, March 25 at 11:59PM PT. A go board shows up in New World, the 2013 South Korean noir film written and directed by Park Hoon-jung. 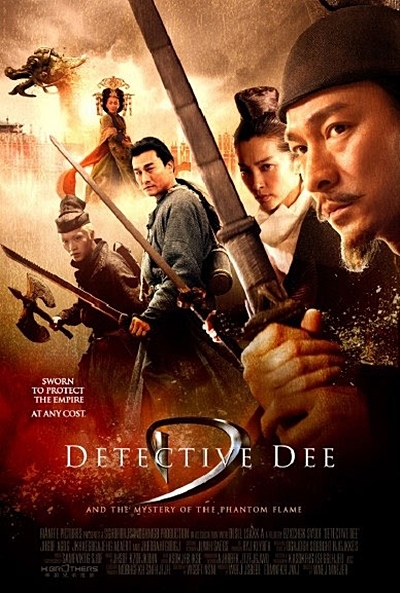 Starring Lee Jung-jae, Choi Min-shik and Hwang Jung-min, the film — released just last month — shows the conflict between the police and the mob through the eyes of an undercover cop. Click here to see a trailer. Thanks to Vincent DiMattia for the tip.